In Baseball, The Casper Ghosts Are No More : The Two-Way Wyoming's Casper Ghosts are moving to Grand Junction, Colo. — and that means baseball is losing one of its neatest team/nickname combinations, just four years after the Pioneer League team adopted the name. 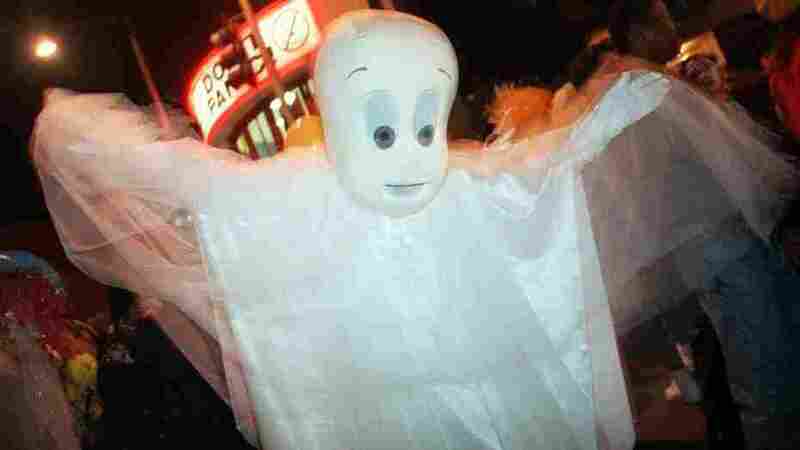 Always Friendly: While no good photos of Wyoming's Casper Ghosts were available, this file image of a Halloween celebrant illustrates the Casper the Ghost spirit. The Casper Ghosts are moving from Casper, Wyo., to Grand Junction, Colo. — and that means baseball is losing one of its neatest team/nickname combinations, just four years after the Pioneer League team adopted the name. The team, formerly known as the Butte Copper Kings and the Casper Rockies, was in the news in 2008, when it announced its unique glow-in-the-dark caps. An affiliate of the Colorado Rockies organization, the Ghosts seem to have ingratiated themselves with the community. A notice on its website announced its partnership "with US Bank, Taco Johns, and the Casper Police Department to provide a positive influence on the youth in Natrona County." The effort evidently included tickets deals for young fans, and the promotion of reading programs. The Host Family Program, which Ray called "the backbone of our organization," had local families who housed players who often were away from home for the first time. He said Casper's families were trailblazers for the program, which he is not sure if Grand Junction will participate. "We had a great nucleus of fans in Casper. They would come night after night. I wish we would have had more fans," he said. The move is simply about money, Ray said — Mesa County, which includes Grand Junction, has more than twice the population of Casper, which reportedly has fewer than 60,000 citizens. And as part of the deal, Grand Junction plans to put $8.3 million into renovating its baseball stadium. The team will now be known as the Grand Junction Rockies.